Outi Pakkanen’s (1946-) first crime novel Murhan jälkeen mainoskatko (Ad Break After Murder) came out in 1973 and since then she has published over twenty detective novels (among a handful of other works). Her latest Marius is out in June 2014. Korttelin kuningatar (The Queen of the Block), first published in 1995, is the seventh book with the character Anna Laine, a freelance graphic designer, who pops up in all the later books as well. It is also the sixth outing of police inspector Matti Martikka. Pakkanen has never given the police a big role in her stories, because, she is quoted saying, she does not know the world of the police well enough to write a police procedural. She has a background in advertising, many of her novels, Korttelin kuningatar and Marius included, feature media, celebrities and PR. Helsinki, Lauttasaari neighbourhood particularly, has a big presence in her work. Her locations are accurate and real, the atmosphere has a local flavour. Her characters speak the local slang with many expressions bastardized from Swedish, Russian and English (a challenge for any translator if Pakkanen gets picked up by an English-language publisher). In 2012 she was awarded the title of “Stadin Friidu” (a slang expression that roughly translates as “City Chick”) by Stadin Slangi, an association dedicated to promoting and studying the Helsinki slang. Pakkanen’s novels are very much portraits of Helsinki, down to the very words she uses. But despite being a “City Chick,” her Helsinki comes across as a village, so tightly are her stories controlled. Pakkanen’s characters tend to shop at the local food hall and they eat very well. Pakkanen is also known for her interest in food, she published a cook book Porosta parmesaaniin. Anna Laineen keittokirja (Reindeer to Parmesan: Anna Laine’s Cook Book) in 2003. The setting of Korttelin kuningatar is very much a city block or two in Hietalahti of Helsinki and a single detached house in Lauttasaari. The gathering place for locals is the corner pub Mr. Pickwick, with a long existence previously under the name Poiju (p 21). Korttelin kuningatar is a simple, cosy, crime story, with a clever idea at its heart. It also has a couple of severe shortcomings. Pakkanen has timed her story carefully, around the 28th of September, 1994. The novel opens on Friday 23rd of September, a day which fills the first third of the book. The narrative then jumps to Tuesday, 27th of September and covers the next four days, concluding on Saturday 1st of October. The sinking of MS Estonia on September 28, 1994 with the loss of 852 lives, on its way from Tallinn to Stockholm, would have been on the mind of anyone reading Korttelin kuningatar when it first came out. This was the worst maritime time disaster involving European passengers since The Titanic sank in 1912, and it took place at Finland’s doorstep, off the Turku archipelago. On the day, every one gathers at Mr Pickwick to follow the news . “Tämmöistä täällä oli viimeksi silloin kun Palme murhattiin.” (“It was like this here last when Palme was murdered.”) Mikko Virtanen observes (p139). On this day, halfway through the book, we learn of the first death. We have to read even further, until Friday 30th of September, before we come across a crime (page 144 of 236 pages). This is the clever kernel idea in Korttelin kuningatar: despite the glaring lack of crime for much of the novel, it reads like a crime story. 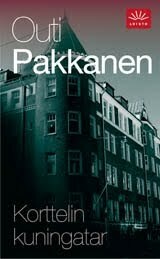 Pakkanen succeeds in this, because she manages to make the reader anticipate crime: you are waiting for someone to die; you are waiting for something awful to happen. When it comes, it is not what you expect. Instead, you have to wait even longer, before it is time to all the police. Only eleven characters have lines in the novel. The suspense is created from the relationships (past and present) of these characters: mother Meri Lappi, two daughters Inari and Salla and granddaughter Vanessa, Inari’s ex-husband Stefan Sjöblom, his new wife Tiia, the wife’s brother Jari Ahokas and, finally, the local photographer Mikko Virtanen, who has had dealings with the Lappi ladies. This is a viper’s nest of a family with as much love, hatred and jealousy squeezed in as possible. Money is the main object of desire and dispute throughout: Lappi’s family fortune, ex-husband’s business success, Inari and Meri’s attempts at come-back (in modelling, p61, and in singing, p101, respectively). Attitude to money comes across as crude and over-egged. People are constantly making remarks about each others' wealth and their own lack of it (pp 40, 43, 63, 82, 90,140, 178, 185, 193, 211). Inari, Jari, Vanessa and Tiia are all depicted as mercenary: “Minähän olen nyt rikas!” (“I am rich now!”) Inari shouts after the crime in the book has finally taken place (p192). Money is established as the number one motivation (and motive?) in the story. Anna Laine and, later, Matti Martikka, observe the events from the sidelines. Journalist Mari Muuronen, the last of the eleven characters, has a cameo. Anna Laine’s role in the story is slightly contrived and explicitly serves the dictates of the plot: sometimes she eagerly seeks out the Lappi ladies (as when she pushes herself under Salla Lappi’s umbrella and insists on giving her a lift, pp32-33, or sticks her foot in the door and almost forces her way into Salla’s flat, p154), sometimes she wants to have nothing to do with them (she turns away a lonely Meri Lappi, p75, and wants to run away from all the Lappis disgusted by Inari’s greed, p212). Despite Anna and Matti Martikka being old acquaintances, it is unlikely for a police officer to discuss a crime investigation quite so freely with an outsider, even if she does cook him a delicious meal (pp196-201). The narrative is an internal third person narrative: the perspective keeps shifting between characters even within single scenes. We see everybody with everybody else’s eyes. This is something Pakkanen does well. The transitions in perspective happen smoothly, they do not jar. Each character stays in character, as a coherent, individual whole, both when observing others and when being observed. Unfortunately, the characters are not very deep; they harbour no deep secrets and offer no surprises, and they are quickly pieced together by the reader, who is left hoping that something more would be in store. The plot in Korttelin kungingatar is not very strong. There are no twists and hardly even any turns. It almost works: because the build up to the crime is so long and because of the shifting narrative perspective, the reader is lured into providing twists and turns of her own. Very early on you start to build different possible scenarios and begin to anticipate events. This is a detective story that works forwards in time: detecting a crime that has not yet happened. I think this is the most interesting quality of Korttelin kuningatar and saves an otherwise mediocre piece of writing. After the crime has occurred, the reader continues to speculate and examine the relationships between the characters. Now, the reader should be in the strongest position: we know more about the past events and the characters involved than either Anna Laine or Matti Martikka, the two detectives inside the narrative. So we should be able to solve the crime, if anyone can. Yet, the end is disappointing, because you know that you are missing some important information. Pakkanen runs against a classic hurdle of all mystery authors: if you have an omniscient narrator that freely flits from one character’s head to another, how do you convincingly hold back the crucial piece of information in order to delay the solution? In Korttelin kuningatar this is done very clumsily, without any attempts at hiding it: Tiia talks to Stefan (pp72-73) and Salla talks to her mother Meri (pp.102-3). In both scenes the women are nervous, agitated and the words pour out uncontrolled: Tiia’s “kaiken yhtenä ryöppynä” (p73), Salla’s ”sekavasti ja yhtenä ryöppynä” (p102) (“all in a torrent,” “jumbled up and in a torrent”). But what words? The reader is not told. It is clear that in these scenes important information is shared. This becomes even clearer when shortly after each event, something dramatic happens to the recipients of this information (Stefan and Meri). It is almost as if Pakkanen gave up here, unable to figure out how to manage the plot, she ignores the hurdle. This is really where Korttelin kuningatar disappoints and Pakkanen does a bad job. It is no crime to artificially contrive to hide clues and postpone the final resolution of a mystery, but it is a crime, or at least shoddy writing, to let the reader be an eye-witness to how it is done. It hangs in the balance, whether the poor plot management in the end obliterates the unusual pleasure of anticipating the crime of a crime novel.